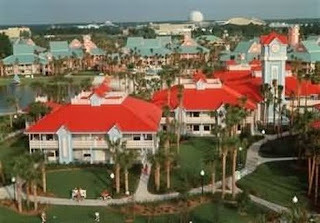 The largest moderate resort at Disneyworld is the Carribean Beach Resort. Organized by clusters of buildings named after Carribean islands, each "island" has its own white sand beach, bus stop and pool. The "islands" are centered around a lake and a hub known as Port Royale. 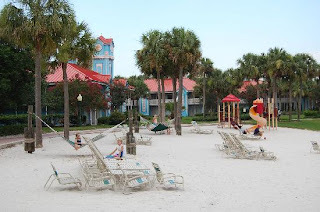 Port Royale has several large pools, Disney shops and a food court with one sit-down restaurant, "Shutters." When we read about the hotel on line we thought we were all fired anxious to take advantage of all of these amenities. We imagined ourselves renting bicycles and sailboats, swimming in the pools, lounging on the beach and testing all of the Carribean dishes at "Shutters." Instead, we saw exactly two things at our hotel: Our beds... and the bus stop. There was just too much fun waiting for us at the parks. We hurried out the door every morning early and came home later than we should have at night. We might as well have stayed in a sleeping bags in the bushes outside the park entrances. But not really. Even though we didn't take advantage of all the hotel fun, I'd stay there again in a heartbeat. 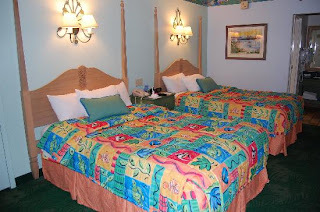 I've never stayed at a Disney Resort before. Here's why I will again. They have continual buses that run to the park every 15 minutes. (When we've stayed at non Disney resorts we had to schedule a bus that would run every hour, and if it was full you were out of luck.) We had extra park hours daily. When it's really crowded, like it was during Spring Break, this is a huge perk. If you time it right, you can hit just about everything that interests you and pick up fast passes while the park is virtually empty. (When we've stayed at non Disney resorts, I was always peering in the parks with jealousy as I waited in lines for the parks to open. Who were those people in there and why did they get to go in early? Now I know.) And here's the best part, in my opinion: your Disney experience begins the minute you land at the airport. Your transportation is clean, organized and easy. You can send your bags directly from the airport to arrive at your hotel door. Then, when you're ready to depart, you can send your bags and sign in for your flight right from the hotel. I'm sold. Even if my flip flops never touch a white sand beach and my big toe never dips into the voluminous pools, it was still absolutely worth it. And as far as the restaurant goes, I've got the cookbook so I can still have a chance to try out Port Royale's "Shutters" restaurant at home. First off, I made the Vegetarian Black Bean Soup with Johnny Cakes. The soup was fast and easy and it was good the first day but even better the next. It's flavored with paprika instead of chili powder like most black bean soups, which makes a pleasant change. The Johnny cakes could have been better, in my opinion. They were flat with not much flavor, but I liked the idea of them. I'm going to try and see if I can pep them up a little the next time I make it. I'll include their recipe, just in case anybody feels like tinkering. I'll be back in a couple of days with our culminating activity, the whole reason for our visit to the parks, The Magic of Healthy Living weekend event at Epcot. Notes: This soup is very inexpensive, but you can save a little more money by using dried black beans. The soup is vegan and you can easily make the johnny cakes vegan by using soymilk. Heat oil in large saucepan. Add oinon, peppers, carrots, garlic, and celery and saute until vegetables are soft. Add cumin, oregano, paprika, hot sauce, bay leaf, cilantro, salt and pepper. Add tomato paste, vinegar, black beans and water. Bring to a boil, lower heat and simmer for twenty minutes. Meanwhile make Johnny Cakes (see below.) Serve soup with johnny cakes, sour cream, cilantro, and lime wedges. I luv black bean soup! The hotel looks amazing, and the perks sound even better! :) I have just about everything I need for this soup-and with the storm heading in, it looks perfect! Can I sub tomato paste for ketchup or tomato soup? Katie-I would use twice the amount in canned tomatoes or salsa. Good luck and I hope you like it as much as we did! Are you sure that's not a cup of mud with some grass sprinkled on top? All right, I hope you're laughing, at least mildly. That was the first thing I thought when I saw that picture. Your trip sounds incredible and that was nice of Disney to roll out the red carpet for you. Next time I come to your house I want to look at that cookbook. My mom and I stayed at the Carribean Beach Resort when I was 8. These photos bring back such GREAT memories! Especially the "bus terminal" photo. I loved those terminals! Les-blah and ha ha! I guess it did look like a cup of dirt. 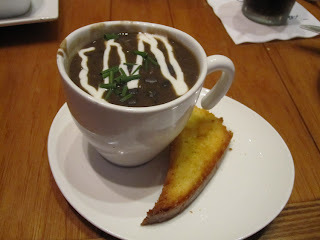 Nobody minds eating a cup of dirt when it is oreo and pudding, but nobody would want a black bean soup dirt look alike. Or would they? I just saw a recipe-can't remember where-with oven dried pureed olives to look like dirt on a plate of spring vegetables. Looks like you all had a wonderful time! Wonderful if I will ever get to go. For now, I will enjoy Disneyland! heehee! Thanks for the recipe! You & Leslie are funny! Hey, I LOVE dirt! We are headed to DisneyWorld next week, and I can't tell you how timely your posts are! It makes me excited for a trip I was really nervous about. Thank you Prudy!!! your trip sounds heavenly. never been to walt disney world, but of course i've been to disneyland lots of times. one of these days . . . Thanks for a glimpse into the CBR! I've never been to that one. Now that we're DVC members, we stay at Bay Lake Towers, which is pretty nice. Soup looks good too, btw. Wish it wasn't so hot here. 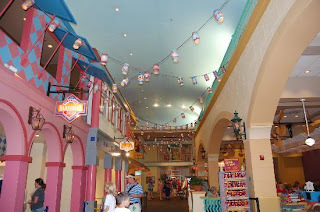 We just got back from Disney World and stayed at the Carribean Resort as well. We have a pirate lover, so we stayed in the pirate themed room. He loved it. We had every intention of taking advantage of the pool there, but never got back in time to do that either. The black bean soup looks yummy! How do you find out about these contests???? Your trip sounds heaven. Never been to Disney World, but of course I have been to Disneyland many times. One of these days..
Next week we go to Disneyland, I can't tell you how to timely your post! It makes me excited trip I really very nervous. Thank you for your Prudy! ! !